After riding and racing dirt bikes for years, I started having problems with my arms and hands. I just couldn't maintain a hold on the handlebars like I used to and enjoyment of my ride suffered as a result. The constant pounding and bigger hits on the rougher tracks and trails would quickly fatigue my hands until I had slow down. Add a few more hits and it became very difficult to work the controls. Not only was this frustrating, it was dangerous. I wasn't alone. Many riders, young and old experience similar problems with fatigue, numb hands or arm pump. I still loved the sport and didn't want to it give up. Being an inventor, I tasked myself with coming up with a solution and the AHIS project was conceived. 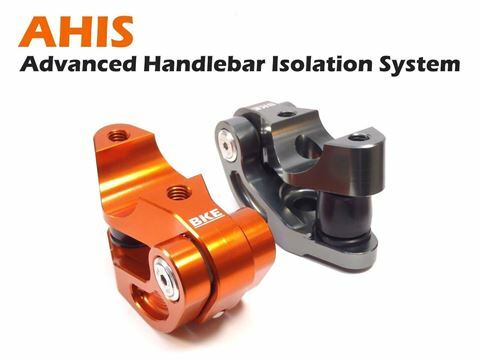 AHIS is the Advanced Handlebar Isolation System. Think of it as a suspension system for your motorcycle handlebars. The suspension on your motorcycle isolates the motorcycle from the terrain. AHIS isolates the rider from the motorcycle. Your bikes' suspension can only do so much; AHIS takes it one step further in smoothing out your ride. What Motorcycles Does AHIS Fit? Adapters will be available for other motorcycle models if there is sufficient demand. Contact BKE Racing if AHIS is not yet available for your bike. Highest quality materials - Stainless Steel and aerospace-grade aluminum. Lightweight and compact - Less 150g (5.3oz) more than stock handlebar clamps, takes no extra room on your triple clamps. Displacement Profile: Click for Graph. Operating Tempurature: -30C to 45C. Stiffness increases 20% at 0C over 20C standard tempurature. Overall weight with mounting hardware: 300g. Maintains precise handlebar feel and control. Less Expensive - No need to replace your existing handlebars or hand guards, just the handlebar clamps. The AHIS clamps themselves are much less expensive to buy. Plus they are easy to install, its a 5 minute job. There is no need to remove your controls or grips. Lighter - AHIS less than 100g (3.3oz) more than the stock clamps. The Flexx Handlebars are HEAVY with the weight high up, the worst place you want it on a bike. Flexx handlebars more than 900g (32oz) to the top of your bike. More Adjustable - The AHIS clamps can be mounted in two different ways depending on your riding style and terrain. Different bumpers are available to make AHIS harder or softer but most riders won't need them. Riding fast and choppy terrain? Install bumpers forward. Riding more technical terrain? Spin them around in 2 minutes, with bumpers back. Better Feel - The Flexx handlebars make your bike feel different since they pivot side to side and each bar is independent of each other and the bike. AHIS pivots front to back (like your bikes suspension), there is no side to side motion, they feel the same as solid mounts, but without the impacts and vibes. In fact pushing on the bars doesn't compress AHIS, it only compresses when your bike hits a bump. More Effective - If you install the AHIS clamps bumpers forward, there is less movement on your wrists as the bike hits bumps. When to you hit a bump, the bike pivots back on its center of gravity, usually around your belly button if you are sitting. Because of the sweep in the bars, this causes your bars to pivot down, causing your wrists to bend back a slight amount. Doesn't sound like much, but repeat thousands of times and it adds to the fatique in your arms and hands. AHIS counteracts this downward rotation, by rotating forward, keeping the bars level reducing fatigue. 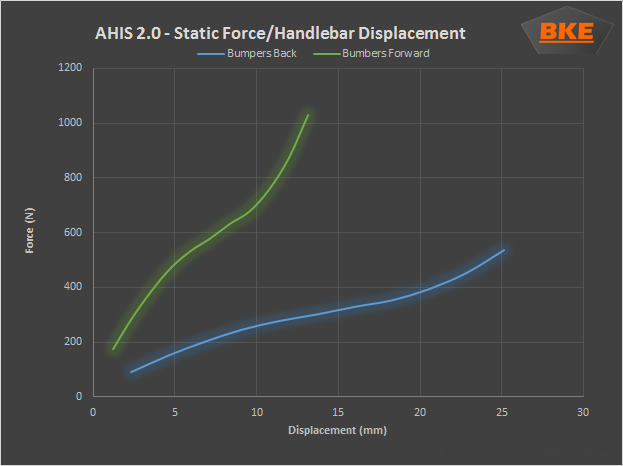 AHIS also has a larger range of motion than the Flexx handlebars. Design - Flexx handlebars use skateboard bushings for their isolation. AHIS uses lightweight, high-tech elastomer bushings that work like mini shock absorbers, with built-in inherent compression and rebound damping. And, AHIS looks much sexier! Simply replace your existing handlebar clamps with AHIS. Use your existing handle bars and hand guards. Try it both ways, and pick the method that works best for you!. Remove the existing handlebar clamp, handlebars and handlebar supports. You will reuse the handlebar clamps and clamp screws. Choose bumper forward or bumper back and install the AHIS by tightening the mounting screw to 40 Nm (30 ft-lbs). Additional thread locking compound is not required as it is pre-installed on the screw. AHIS might loosen up as it wears in. If there is too much play in the bar motion, tighten the pre-load adjustment screws located on each bar clamp. Under normal operations, the AHIS clamp should not require maintenance. However, inspect clamps for wear or breakage monthly. If vehicle is crashed, inspect clamps before continuing to ride. Do not ride with damaged clamps. If required, contact BKE Racing for replacement parts. For disassembly instructions, Click Here. Thanks for the AHIS....It works! I have been using Fasstco Flexx Bars for over 5 years and have always found them to have good dampening. There have been some trade-offs however as they are significantly heavier than stock bars, they limit your hand guard options and the two-way dampening has always felt a little unnatural. I have also researched and read reviews about other bar mounts and bars with built-in suspension but they all seem to be compromised in some way. I donâ€™t want my bars to move in every direction! I am happy to report the AHIS system addresses all of these issues and now I can run any bars and handguards. I had almost forgotten how much lighter my stock bars were. As a pro racer nearing 40 I try to find every advantage I can. Small things can make a huge difference over the course of a 3 hour race. Having a little extra flex helps keep arm pump in check and less swing weight up top is noticeable in tight single track. The AHIS design is really clever and the clamps seem to be very durable. They have taken some big hits and a few hard crashes without a hitch. I am still on the fence on which dampening profile I prefer (forward or rear mount). Nice to have options and they are easy to switch around. Thank you AHIS for some creative engineering! They definitely reduce arm and wrist fatigue. I have broken Scaphoid (Navicular) bone in my right wrist, that is now arthritic, so I am very sensitive to sharp impacts while riding. The AHIS mounts work well at not transferring sharp impacts to my wrists.